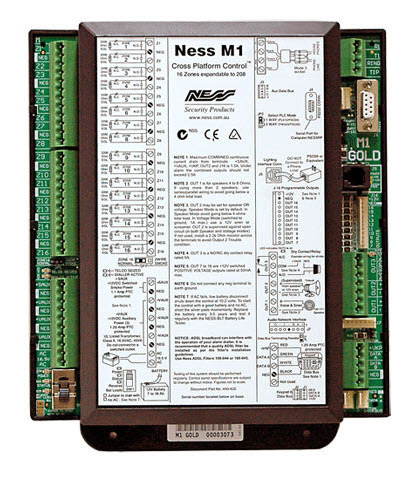 The Ness M1 (EZ8, EZ24) is both a Security & Automation controller. This state of the art cross platform solution can be used to control security, automation, access, lighting, HVAC, CCTV, entertainment, & other electrical devices. User interfaces include keypads, telephones, wireless key fobs, or proximity fobs/cards and range of wireless sensors. Pleasant voice announces system status, allows for telephone remote control, & alerts you while you are away with a phone call to advise critical temperature levels, water leaks, children arriving home from school, etc. When integrated with iMCA System, you can, not only remotely control up to 208 relays and attached devices from virtually anywhere, but also create virtual connections with any switching and sensing devices registered in the iMCA System and M1 such as motion sensors, mechanical contacts, fluid level sensors, gas sensors, smoke detectors, temperature and humidity sensors, air flow sensors. The iMCA System easily integrates with M1, and by so doing not only can you simplify use of the M1 system but also bring the functionality of this fabulous controller to a new level, creating lifestyle enhancing comfort, convenience, and security. When M1 is used with the iMCA System, you can easily create and execute any number of automation scenarios based on time schedule or sensor information across the same or different physical locations. Ideal for medium to large projects with multiple monitoring and switching points, where future expansion is envisioned and when advanced interaction with Power Line Carrier (PLC) technologies such as X10, A1, Xanura, Lutron, UPB, OnQ-ALC, Clipsal C-Bus, HPM iControl, Dynalite, Insteon is required. Large zone capacity, expandable to 208 zones. Flash Memory - Allows field updates to firmware. RS-232 serial port to interface to Computers and other devices (expandable to 8). Time/Date stamped 512 event history log. Link up to 6 words/phrases per announcement. 13 On-Board Outputs: 1 voice driver/siren, 1 siren driver/voltage, 1 Relay, and 10 voltage outputs - expandable to 208 outputs. Includes Fire alarm verification routine. Can be partitioned into 8 separate areas and accounts. 199 User Codes (4 or 6 digit) with assignable authorities. Arm levels: Away, Stay, Stay Instant, Night, Bite Instant,Vacation. Plug-in terminals make service and pre-wire simple. Hardware "watchdog" and nonvolatile EEPROM memory. Supervised power supply over current. Optional Ethernet port for user operation, programming. Built-in Telephone Remote makes any phone a keypad. Integrated Voice Dialer uses vocabulary or custom word/phrases. Digital Dialer: SIA, Contact ID, 4 + 2, and Pager. Ness-RP PC programming software includes conflict resolution to easily highlight differences between control and PC. Connection methods include: Dial-up (including automatic answering machine bypass), Ethernet, or local from RS-232 port or house phone jack. You can source Ness/ELK M1 Gold from the vendor directly, your preferred distributor or from us as a standalone module for US $650 (plus postage and handling) or as a part of iMCA Controller package. If you are looking for economical solution Ness offers M1 E-Z8 (US $450) and EZ-24 (US $550) members of the M1 control family, for installations not requiring the voice and telephone remote control capability of the M1 Gold. We also can supply wide range of M1 Expanders & Interface Modules as well as different wired and wireless state and security sensing devices. As we work with our clients directly helping to shape their automation projects we do our best to minimise all costs wherever possible. Please contact our support service should you have any questions relating to this hardware or how it can be in use for your automation project.